Ceramics workshops as well as regular workshops in many related creative art, craft and artisan fields. Firebird Studios holds regular workshops in all aspects of advanced ceramic studies, as well as workshops in many types of arts and crafts. Learn to throw off the mound – teapots and sets. Measure the clay in your hands, control shape, throw lids, throw spouts, throw to lid size, image the final product in pieces! Meditate on a word/feeling, then shape clay with your hands to express that feeling, blind folded! Opens up your kinesthetic/visual synesthesia – the ability to feel what it looks like and see with your feelings! No judgement on your creations – let them flow, have a laugh, talk through the process in the group for greater understanding of creativity! Learn how to wire sculpt a tree of life with crystals, wire and a rock! It’s easy, minimal tools, and you can take your finished work home with you after this workshop! Half day workshop to learn the basics of lino printing, produce your own small lino print, and colour it. Take home your own original art work, and keep your lino block so you can produce more individually coloured works of art. Half day workshop in the new jewellery buzz of wire wrapping. Learn the basics of wire types, tool handling, wrapping techniques, and basic jewellery making. Expert tuition by Gianni Gabrionelli, jeweller to the stars. Materials for two pieces to take home for a small extra charge. Take your wheel throwing skills to a brand new level. This half day workshop is limited to just 6 participants. You will get expert tuition from production thrower by trade, Lynda Lehmann who has ben at the wheel for over 40 years! Materials provided. Pay for any finished work. Personal feedback, hints and tricks, concentrated practice! This is not a board full of cut outs! No! We will be dreaming, creating, visioning and manifesting! Your vision board will be a beautiful expression of your deepest desires, let out unconsciously and allowed to create itself. This half day workshop will see you take your life creation to a brand new level. This half day workshop is focussed on the art of mould making. We will use various forms to make various moulds for slip casting and drape/slump moulding. Potters Plaster is a potter’s best friend in the creativity game, and we will learn to use it to it’s maximum! Lead by Mark Brebner, qualified plastics technician, this half day workshop will take you through the technical aspects of resins and plastics, safety in handling, colours and more. Then we will begin creating resin art. On canvas, on timber, and free form! 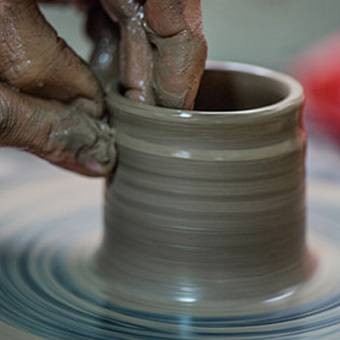 It’s one thing to come to workshops and create nice items, or to take pottery classes and make a variety of pots. When you are ready to take your craftsmanship to another level, lets talk “range”, or style! Formatting a unified look, a statement that reflects your inspirations and uniqueness, takes skill! You will leave this workshop with a clearer idea of wo you are artistically and creatively. Regardless of your art form, learning the properties of water colour and being free to do a “one shot, one stroke” approach, will enhance every aspect of your main form. Lead by a Gold Coast well known artist, we will explore the art of water colours! Using recycled materials you will design, plan and execute a small coffee table to take home. Learn how to work with timber and power tools! This workshop will introduce you to the exciting world of woodwork and give you the basic skills to be able to follow patterns and projects you find online. Sign up for our newsletter to keep in touch and be notified about upcoming workshops. Places are always limited and demand is strong!